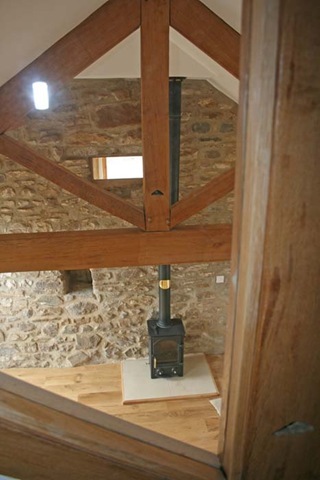 Eco-friendly living with geothermal heating can be fun as Rosi Keatinge found when she helped to transform a small barn in Wensleydale into a dwelling with the smallest carbon footprint possible. The barn at Garriston near Leyburn with its panoramic views of Lower Wensleydale was almost derelict when she had her husband, Dr Dyno Keatinge, decided to turn it into a two-bedroom home. Above: As the barn is now with its French doors facing south to collect heat from the sun. 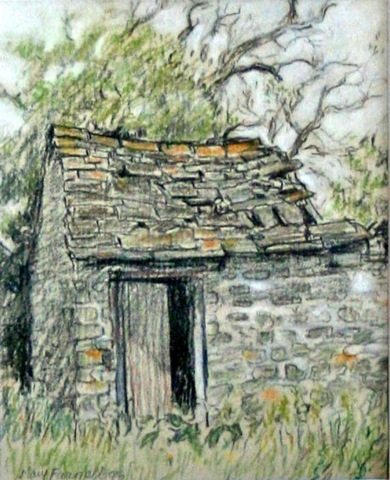 Below: Mary Farnell’s painting of part of the barn when it was derelict. Dr Keatinge was the director general of the World Vegetable Centre in Taiwan and spent a lot of his time trying to convince people throughout the world of the importance of growing their own vegetables and having a balanced diet. So Rosi had the job of searching for local products for the barn conversion when not teaching music. They have named the dwelling Rufus Barn after a golden retriever who was a much loved family pet. She is delighted that most of the oak used for the bespoke kitchen and the roof trusses travelled only a few miles from where the tree was felled via Wensley saw mill and Calvert’s workshop in Leyburn. To make the best use of natural light there are French windows in the kitchen, sitting room and main bedroom, and glass has been inserted between the traditional roof trusses. The sitting room as seen from the storage space above the second bedroom. “The trusses are so wonderful. There is a bolt through the middle and that’s it. Then there are pegs and so every year or so you will knock the pegs in a bit more. Oh – and a few makers marks,” said Rosi. Calvert’s craftsmen also produced the kitchen counter tops made from the fossil-filled stone from Leyburn’s Shawl Quarry. And, before Rufus Barn was let to a tenant, Rosi loved standing in the kitchen and looking across Wensleydale to Jervaulx where the stone for the floor was quarried. “It’s the same stone as was used to build Jervaulx Abbey,” she explained. 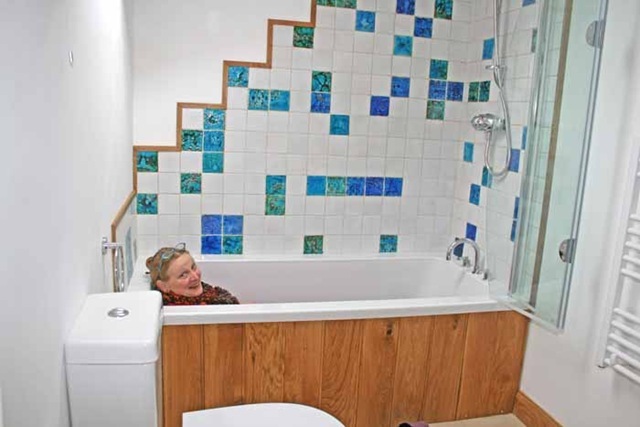 She is especially pleased with the tiles handmade by Caroline Hudson. Rosi spotted those at an arts and crafts fair at The Station in Richmond (North Yorkshire) and has integrated them into the design of the bathroom, toilet and kitchen. She was very careful to make sure that the bath and toilet were just right! “I sat in many baths and on many lavatories to make sure that they were comfortable,” she said with a laugh. In the end she chose an ideal standard bath at Homebase. Some of the walls have not been plastered so that original features can be seen. These include the original outer wall now in the kitchen complete with lichens, and the clamp bricks in the sitting room. These would have been baked in small kilns in the late 19th and early 20th century and were used to make the animal stalls. “There’s a patina to those bricks which is very attractive,” she said. They have been careful to retain the integrity of the barn and its rural charm. “It’s an amazing part of the world – we have got everything. The sunrises are beautiful and there are wonderful trees, the wild flowers are super, and there are resident hedgehogs, stoats, little voles and many birds.” Her tenants won’t be allowed to keep cats because she is so keen to protect the small birds that flock to her garden next door to Rufus Barn. Below: Rosi just making sure that the bath still feels right! Rosi and Dyno may consider retiring to the eco-friendly barn they have created, with its geothermal under-floor heating, and its great views across Wensleydale.